Proponents of emotional intelligence (EI) often view effective coping with stress as central to the EI construct. In fact, current thinking among EI researchers suggests that the way people identify, understand, regulate, and repair emotions (in self and others) helps determine coping behaviors and consequent adaptive outcomes. The scientific merit of EI plausibly rests on the working assumption that EI is a coherent attribute of the person that supports and contributes to adaptive coping. 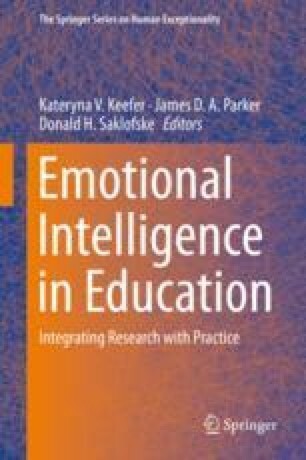 In this chapter we review what we have learned so far about the role of EI in coping with stress and in supporting adaptive outcomes – with special concern for students in achievement settings. We briefly discuss the role of emotions and emotional competencies in learning contexts. The nature of coping is then described, along with conjectures from the available literature about the likely association between EI and different coping styles. We survey the empirical literature on the role of EI in coping with stress and in affecting outcomes and conclude by presenting a number of concerns regarding attempts to explicate the EI-stress relationship.